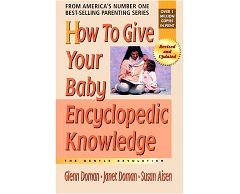 Revised and updated edition by Glenn Doman®, Janet Doman and Susan Aisen. Imagine a two-year-old's delight if he were able to recognize an owl in a tree, a bee on a sunflower, or a painting by van Gogh. Learning and absorbing information, say the authors, is a brain function. Very young children can absorb information without effort and find enormous pleasure in doing so. This book shows just how easy it is to teach a young child and what great fun early learning is to both the child and his parents. The authors present a step-by-step program that enables parents to create a joyous and productive learning environment at home.